This series comes at a time when Bangladesh’s future as a Test team is under question, after the distasteful draft proposal was revealed last week. Under the terms of the proposal, the Tigers could be relegated to the Intercontinental Cup from 2015 instead of being a Test nation, a move that reeks of selfishness from the richer boards. Indeed, the best way for Bangladesh to send across a message would be to give their best on the field, and for its fans to throng the grounds for the two Tests – something which has not been seen in the last few years. The short series will begin with the opening match at Dhaka’s Shere Bangla National Stadium in Mirpur from January 27-31. The second and final Test will be played between February 4-8 at the Zahur Ahmed Choudhary Stadium in Chittagong. Sri Lanka have played once at Mirpur and twice at Chittagong, winning all three times. Bangladesh’s record at both grounds is poor – eight losses and two draws at Mirpur; eight losses and three draws at Chittagong. Bangladesh (1st Test) – Mushfiqur Rahim (captain), Mahmudullah, Abdur Razzak, Al-Amin Hossain, Marshall Ayub, Mominul Haque, Nasir Hossain, Robiul Islam, Rubel Hossain, Shakib Al Hasan, Sohag Gazi, Tamim Iqbal, Shamsur Rahman, Imrul Kayes. Uncapped 25 year-old opener Shamsur Rahman has been rewarded for his form in the first-class circuit, where his most recent innings fetched him 267 runs. He is likely to partner Tamim Iqbal at the top. Imrul Kayes has been recalled to the squad as the third-choice opener. Two-Test old Marshall Ayub may bat at No.3. The middle order has shown immense maturity of late, with the likes of Mominul Haque, Shakib al Hasan, captain Mushfiqur Rahim and Nasir Hossain forming a strong quartet. Mominul has had a great start to his career, and is the best young batting talent in the country. The spin attack is in the safe hands of Sohag Gazi and Abdur Razzak, along with Shakib. Rubel Hossain and Robiul Islam will lead the pace attack. Rahim has a lot more on his plate than the performance of his team in this series. Under his leadership, Bangladesh have finally seemed to display some sort of competitiveness in the Test arena. Cruelly, at such a time, a proposal to rob them of their Test status is being mooted through a ridiculous two-tier system. However, a strong showing against the Lankans will go a long way in drilling some sense into the selfish proposal-setters. The diminutive wicketkeeper-batsman has grown into a mature cricketer, and recently became the first to raise his voice against the draft proposal. 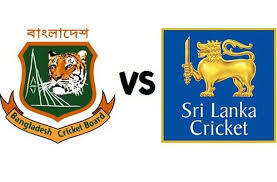 Sri Lanka – Angelo Mathews (captain), Dinesh Chandimal, Dimuth Karunaratne, Kaushal Silva, Kumar Sangakkara, Mahela Jayawardene, Kithuruwan Vithanage, Prasanna Jayawardene (wk), Dilruwan Perera, Rangana Herath, Ajantha Mendis, Suranga Lakmal, Nuwan Pradeep, Shaminda Eranga, Vishwa Fernando. Sri Lanka have made two changes from the squad that drew the series against Pakistan in the UAE recently. Off-spinner Ajantha Mendis, who has had success mostly in the limited-overs formats, makes a return to the Test team, replacing Sachithra Senanayake. 22 year-old Kithuruwan Vithanage, whose only two Tests are the ones against Bangladesh in their home series last March, comes in for an injured Lahiru Thirimanne. Sri Lanka’s young batsmen and their fast bowlers showed that they belonged to the top level through a string of impressive performances in the UAE. Besides captain Angelo Mathews, both Dinesh Chandimal and Kaushal Silva proved that the stocks are not barren whenever veterans Kumar Sangakkara and Mahela Jayawardene play their last. The fast bowling was even more heartening, with Shaminda Eranga and Suranga Lakmal standing up to the task, and they will provide welcome support to left-arm spinner Rangana Herath. Mathews came under a bit of criticism following his negative time-wasting tactics during Sri Lanka’s loss against Pakistan in the final Test at Sharjah, and his over-cautiousness may have cost his side a rare overseas series win. Nonetheless, the drawn series was still a positive result for his side, who will look to build on that in Bangladesh. Mathews was in great touch with the bat against Pakistan, topping the runs chart with 412 and he will look to continue to lead his team from the front. The two teams have contested 14 Tests in all so far, with Sri Lanka winning 13 of them – 7 by an innings – and the remaining one being a draw. That draw came at Galle last March, where Bangladesh racked up their highest ever total of 638. That game was the first of the latest series played between these teams, with Sri Lanka clinching the second and final Test to win 1-0. The two teams have met four times in Bangladesh – in two-Test series in 2005-06 and 2008-09, both of which were won 2-0 by Sri Lanka. None of Bangladesh’s seven innings defeats against Sri Lanka have come at home. Bangladesh are currently ranked – as has almost always been the case – at the tenth place in the Test rankings, 16 points behind 9th-placed Zimbabwe. Lack of fixtures is also hurting the team’s progress, which is now unfairly considered to be obstructed for good through the above-mentioned draft proposal. Of late, they have shown visible improvement in their Test performances, their latest series being a creditable 0-0 draw at home in a two-Test series against New Zealand in October. Prior to that, they drew 1-1 in Zimbabwe, where they achieved only their fourth Test match win ever. Bangladesh have never won a home Test against a ‘top eight’ nation. Their last series win was in the Caribbean back in 2009, when they beat a severely depleted home side. Sri Lanka played some much-needed Test cricket when they took on Pakistan in the UAE recently, and went on to perform much better than expected. The 1-1 draw in that series was their first overseas series against a higher-ranked team in which they avoided defeat since the 0-0 draw in Pakistan in 2008-09. Their last series win was against Bangladesh at home last March. Their last overseas series win was in Bangladesh in 2008-09. Their last overseas series win over a ‘top eight’ nation was way back in 1999-00, when they triumphed in Pakistan. Sri Lanka’s encouraging display in the UAE will give them the confidence to better their abysmal on-the-road record. They are placed 6th in the Test rankings, three points ahead of 7th-placed West Indies. 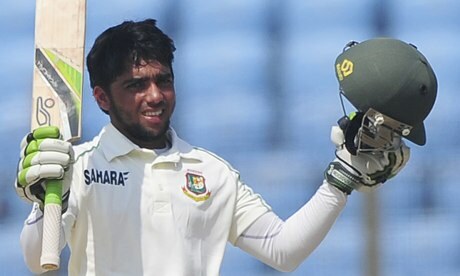 22 year-old Mominul Haque has played just five Tests and his average is an imposing 83.42. Having made an impressive debut in Sri Lanka last year, he recently flayed the visiting New Zealanders with two centuries in as many Tests (topping the series charts with 376 runs) to make the world notice of an exciting new talent. The left-handed batsman’s 181 against the Black Caps at Chittagong was one of the finest innings played by a Bangladeshi. He is the perfect number four for the Tigers and has the right mix of aggression and caution needed to unsettle the bowlers. He will be setting his sights on more big scores against the Sri Lankans. Shaminda Eranga was the most effective of Sri Lanka’s pace bowlers against Pakistan, taking 12 wickets at 28.75. The right-arm bowler, who took a wicket off his very first delivery in Test cricket in 2011, has it in him to be his country’s fast-bowling spearhead over the next few years. Having played all but two of his ten Tests in the sub-continent, Eranga has the exposure of bowling on tracks unresponsive for the fast bowlers. Bangladesh’s top-order, who often attack needlessly, will have to play very well against him if he maintains the same consistent line and length that he did against Pakistan. With the hosts aiming to justify their presence on the Test table like never before, this series can be expected to be more closely fought than any of the previous series between the two sides. I go for a 1-0 win for Sri Lanka, but it will not come easy.